Delete, delete, delete Tumblr.. Such a remarkable start to this post right ? Well as you might have guessed we’re going to talk about how to delete a Tumblr blog, how to delete Tumblr, how to delete Tumblr posts, how to delete a Tumblr account and even address using the Tumblr mass post editor too. And you may be wondering.. why ? In the case of what we’re going to talk about today, Tumblr is a popular micro blogging platform allowing you the ability to create short posts complimented by photos and videos. With that said, in continuing on with the big names listed above in the blogosphere it makes sense to engage in conversation about different blogging platforms and different aspects of them that both casual and professional bloggers alike deal with respectively in and on these platforms. As we look into delve into how to delete Tumblr blogs and accounts, the first thing that I will say is that you need to obviously log into your Tumblr account. Once you’ve done that, learning how to delete Tumblr blogs is pretty straightforward. You can find the delete option in the appearance settings and in the general settings section by simply navigating to the upper right hand corner of your page after you’ve logged in. On the far right at the top of the page, click the last icon next to the pencil icon. You’ll see your account and the option to logout. You’ll see likes, following, settings and help. Navigate to the Tumblr settings option. Once you’ve opened the corresponding page, you’ll see a number of options on the settings page. Options include: email, password, security, availability etc. Just navigate to the bottom of the page and you will see an option to “delete account”. You can also access this from the edit appearance section. This can also be found by navigating to the top right of the page on your dashboard after you have logged in and clicking on the last icon next to the pencil as mentioned before. Once you’re there the last option available to you will be “edit appearance”. Just navigate to the last option on the bottom right of the page and you’ll see the button to delete your Tumblr account there too. This can be tricky if you have never done this before particularly in the case of a new Tumblr user. For those that are familiar with this platform deleting a single post is a simple process. However, for the uninformed, I will explain just how simple this can be. What we don’t know is always a bit frustrating until we’ve been shown how to accomplish the task we’re trying to complete. The first thing that you’re going to do is go back to the Tumblr dashboard as seen below. 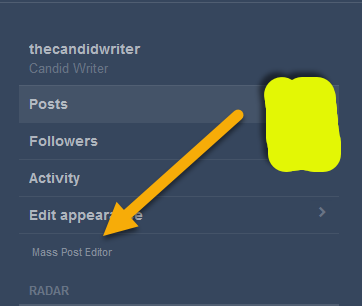 Once you’ve reached the Tumblr dashboard, click on the account icon as noted by the red arrow in the image. You’ll then need to head to where it says posts. Simply click on the posts link to be directed to the page where all the posts you’ve written are located. Use the post options button to access the edit and delete functions for each individual Tumblr blog post. Clicking the delete button will delete your single Tumblr blog post. You can use this on any Tumblr blog post that you compose. Utilizing the Tumblr mass editor tool allows you to edit and / or delete multiple Tumblr blog posts at the same time. This is also referred to as the Tumblr mega editor. You’re going to take the same steps that you took in the last section to access this area. Navigate to the account icon at the top right hand corner of the page. Once you’re there, navigate to posts. Click on posts. As you can imagine, the function to delete a Tumblr post is self explanatory. It will delete the Tumblr post(s) that you’ve selected. The edit tags and add tags allow you to either edit the tags associated with the posts that you’ve selected or add to them all at once without having to do this individually. The unselect function is meant to allow you to be able to quickly deselect any posts that you’ve selected for editing or deletion purposes. Additionally, to add a few more notes on your desire to delete Tumblr posts or blogs, if you do decide to make any deletions, you will be provided with a delete Tumblr post confirmation dialogue box to confirm your action. It is also not possible to delete Tumblr blogs on a mobile app as it must be done through their desktop website. Also understand that if you proceed to delete Tumblr blogs through the delete account function, once this has been done your information cannot be recovered and any secondary blogs associated with your account will be deleted as well. Any information associated with your Tumblr blog will not be recoverable so be sure that this is something that you actually want to proceed with to its conclusion. Thanks for reading. If you liked the post, please use the share buttons below or view other Tumblr blog related content here: Best Tumblr Posts.